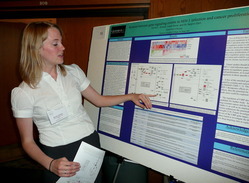 2010 Biology graduate Nicole Soiseth presents her research results. Nicole is currently finishing her degree at UW's School of Medicine. The Biology Department is proud of our students' high participation in the campus exhibitions of the Sigma Xi Symposium and the Celebration of Creative Inquiry. These are venues for Gustavus students to present their research findings to the entire campus, parents, alumni, and our local community. The next Sigma Xi / CCI will be held Friday, May 6, 2017 in the Nobel Hall of Science (for Sigma Xi) and the Jackson Campus Center (CCI). What kinds of things can you see at this event? Dr. Abu Hassan Ahmad, a Professor of Biology at the Universiti Sains Malaysia. Understanding vector biology of dengue vectors: Implications to disease transmission in the tropics. Dr. Kandice Fero, a post-doctoral researcher with Dr. Harold Burgess in the Unit on Behavior Neurogenetics, Section on Developmental Biology at the National Institute of Child Health and Human Development (at the NIH). Neural control of behavior: insights from larval zebrafish. Dr. Mariana F. Wolfner, Professor of Developmental Biology at Cornell University. What's love got to do with it? How male-derived proteins regulate reproduction in female fruit flies.